Agrilite has become synonymous with comfort and durability. These hard-wearing polyurethane boots with their elegant fit are light, feel supple and give your feet energy throughout the day. 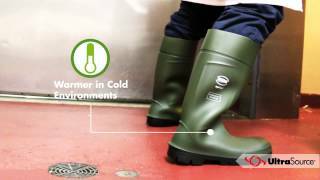 This poly boot is resistant to oil, fat, manure and various cleaning products! Safety comes first. That's why these boots can also be supplied with a steel toecap and sole. Thanks to their improved and SRC-tested sole profile, you can wear them when you're working indoors or outside. Bekina® is always looking for innovative ways to maximize your comfort. These boots have a handy release button so you can take them off easily.